SUBJECT A Report to the President on the Recent Archaeological Survey at Kros Rockshelter, Balungis, Balulang, Cagayan de Oro City. 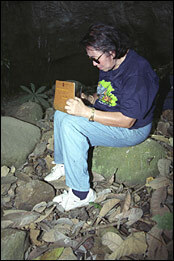 On September 16, 2001, a composite team of researchers ventured a half-day reconnaissance survey at Kros Rockshelter. The surveying team left Xavier University (XU) at 7:30 a.m. Msrs. Ignacio Borja and Elson Elizaga had generously shared us their vehicles in going to the survey site and back to XU. Since all of us were not familiar of the site, we asked different people who owned small stores along the road in Balungis (or Balonguis). When we reached the Balonguis creek, an old woman, a native of the place, advised us to follow on the trail leading to the property of Mr. Sencio Abonitalla where the foot of the Kros hill is situated. From the road, we strolled on a footpath about a hundred meters before entering the property of Abonitalla. When we reached there, a number of houses dotted the area where the clan of Abonitalla inhabits. A certain Felix Tagam met us on the way. We introduced ourselves and informed him of our purpose. He was very much pleased upon hearing that we were researchers from XU Museum. He, however, warned us not to proceed without securing first a permit from Manresa, otherwise, we might be tagged as illegal trespassers. Ms. Trel Borja, a faculty of XU DevCom and team participant, volunteered to secure possible permit because of her connection with Searsolin. She had to make her way back to the road where we dropped. She was to be accompanied by her husband who had to take her to Searsolin on a Estrada pick-up via Carmen and Balulang junction, subsequently turning left to the main road up the Carmen hill. Indeed, it was a tedious and tiresome routine on the part of the couple. After obtaining clearance from Searsolin, we started to ascend the slope (at 9:30 a.m.) passing through an opening of the concrete fence. We requested Mr. Tagam to be our guide; he agreed. The trail going up the hill was precipitous and slippery. Banana plants abound the surrounding area pooled with "bulonsiri" and creeping "hibi-hibi" (both are climbing herbaceous well known for its prickly/ thorny vines). 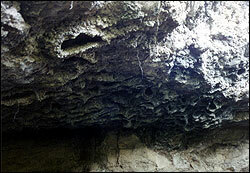 Upon reaching more than a hundred feet, we were brought to the fore of the rock shelter. 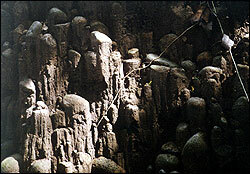 The rock shelter is actually a sandstone-conglomerate formation covered with balete, vines, shrubs, ferns and other wild plants. Kros, as it is known because of the patron of the sitio is "Sta. Cruz" (sic Mr. Tagam), is a prehistoric archaeological site. 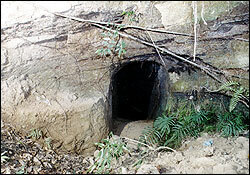 It is located on a promontory hill at Balungis, Balulang, Cagayan de Oro City. It is now part of the XU estate adjoining the southeastern wing of Manresa agricultural complex. (Our informant and guide had informed us that this particular property was recently acquired by XU. which formerly a part of the Abonitalla property.) this site is very accessible to Balulang road passing through Abonitalla property along the creek where a portion of the concrete fence recently collapsed due to heavy rains. 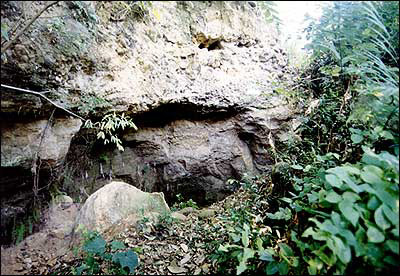 Mr. Angel Bautista, an archaeologist from the National Museum, had made initial surface scan of this archaeological site in 1991. His finds consisted of human skeletons and pottery sherds with varying forms and designs. All of this findings were properly documented and registered under code X-91-S3 of the Archaeology Division of the National Museum. The survey team was composed of Dr. Erlinda Burton, Director of RIMCU, our team leader, Mr. Antonio Montalvan, local historian; Mr. Ignacio Borja of the Tampuda Foundation and his wife, Ms. Trel Borja, a faculty of XU DevCom; Mr. Elson Elizaga of Nazca Graphic Design and Photography and the undersigned representing the Museum. With the surveying team, there were also five junior XU DevCom students (under Mrs. Borja) who participated in this expedition. Many of the students of Ms. Borja were not able to join because of the intramural going on in the campus on the day of the activity. The participating students (Joan Daba, Karen Obsiana, Webster Pastrano, Queenie Sabanal and Iris Montellano) were given each a one-page handout and briefed them about the purpose of the activity, the basic field methods as well as the importance of preserving our cultural heritage. They enthusiastically helped a lot in gathering pottery sherds and bones that were found on the surface of the survey area. There were manifestations that "tomb raiders" (treasure hunters, robbers & vandals) dreadfully destroyed this archaeological site. Our guide, a long time resident of the place, had told us that way back 1970s and even in the early 80s, some hunters had broke into the area and looted priceless materials, i.e. jars of prehistoric and Ming periods, gold necklace, etc. Despite of the fact that the site had been disturbed by unscrupulous criminals, we were still able to recover from the surface area plenty of material evidences (pottery sherds and human bones) which, according to Dr. Burton's estimate, dates back to late Neolithic. But this has to be verified through a technique known as "acid racimization" by experts of the University of California at San Diego. The artifacts recovered are now in the custody of XU Museum for further analysis and study. Encourage a joint RIMCU-XU Museum excavation project to be undertaken soon involving students that would like to enrich their knowledge on archaeology, field methods, culture, environmental protection etc. Explore possible grant from both domestic and international funding agencies that are interested in the preservation of cultural heritage and environment. Undertake the systematic recording of archaeological materials including those found in Huluga and other sites. Request the President to convert the temporary classroom on the third floor of Museum to be used as working room and shelter of archaeological artifacts recovered. Publish news reports and updates that would instigate people especially in Northern Mindanao to appreciate their own culture and to support the effort of preserving our cultural heritage. Coordinate with the National Museum to secure the necessary permit for exploration/ excavation of the archaeological site including necessary supervision that may arise in due course. Published by the Heritage Conservation Advocates, Cagayan de Oro, Philippines, October 1, 2001. Revised July 25, 2003.